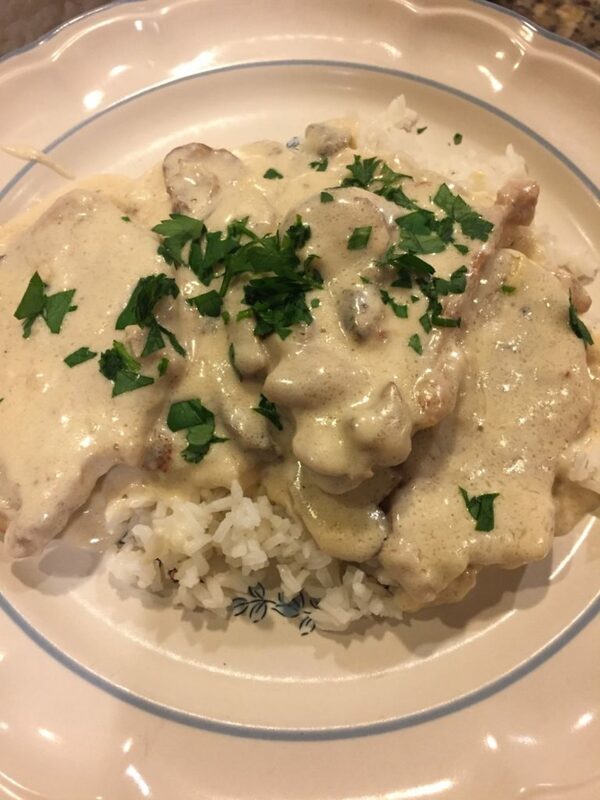 Pork Chops and Mushrooms in Parmesan Sauce – Mama, Can I Lick the Spoon? Life has been crazy lately. The kids have both reached the age where it seems that all we do is drive them around to their various activities or just sit in the car and wait for them to be finished with whatever they’re doing. It never seems to stop! You know, as well as I do, that when life is jam-packed with activities and busy-ness, it can be hard to stop and cook a hearty meal for your family! Luckily, this one didn’t take long! 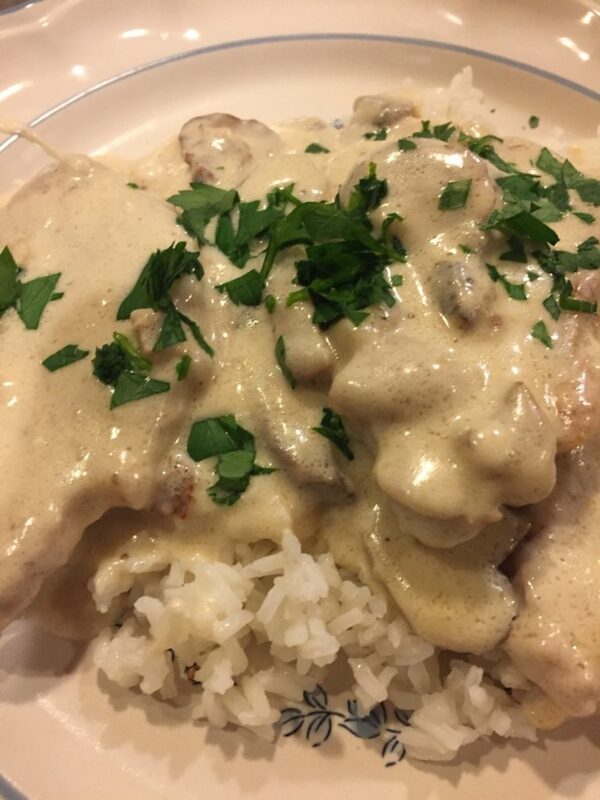 We love pork chops and we love mushrooms. Pair them with an unbelievably rich and tasty Parmesan cream sauce and you’ve got a winner! In a large skillet, pour about an inch of vegetable oil and bring to high heat. Season both sides of the pork chops with salt and pepper. Sear the chops on both sides, until golden brown. Remove to a plate. Add the mushrooms and stir, adding more oil if they look dry from absorbing the remaining oil. Add a couple of pinches of salt. Sautee for 10 minutes – or until mushrooms are soft and dark brown. Drain off any liquid. Add the garlic and cook for 1-2 minutes. Add the butter and stir until melted. Sprinkle in the flour and stir for a minute or two to allow the flour to cook. Add the cream and stir to incorporate. Bring to a bubble and add the milk. Once the mixture is bubbling and thickened, add the Parmesan. Add more salt to taste, if needed. Add the pork chops back into the mixture, submerging each one. Reduce the heat and simmer for 15 minutes to allow the pork chops to cook through. Well Duh #1: Parmesan is salty, so wait to taste before adding any extra salt. Well Duh #2: I served this over rice with a little chopped parsley on top. Well Duh #3: I used whole milk, but I have used skim before. It totally works. This is a keeper! Even after the pork chops were gone, there was a good bit of the sauce and mushrooms left. I made a little more rice and placed the rice and sauce in a few single-serve containers. This made a delicious lunch for a few days! This dish takes less than 30 minutes to prepare. It really took me a little less than 25. Perfect for busy day!